What is the Regional Alumni Rally? The Regional Alumni Rally Competition is a law school chapter-based-campaign to foster a sense of pride, provide increased scholarship support for current law students and encourage alumni giving. Regions compete for bragging rights and a scholarship for a student from their region. The goal is for each of the USD School of Law Regional Alumni Chapters to achieve a 10% participation rate for donations and gifts to USD. Winning regions - those who reach their 10% participation goal - will be featured in a press release on the law school's homepage and in the Docket, the law school's monthly alumni newsletter. The region with the highest participation percentage will win the opportunity to award a $2,000 scholarship to a newly admitted student or current student from that region. This year, law school alumni chapters are competing to see who achieves the highest alumni participation rate for donations to USD School of Law! Las Vegas and Reno (NV) - NEW! You don't have to wait to support law school students and cast your vote of participation for your regions. Make your annual gift today! Giving provides an opportunity for alumni to express gratitude and say "thanks" for their USD School of Law experience. Giving to the law school is one way to pay it forward and support students who are currently applying to or achieving success at USD School of Law. 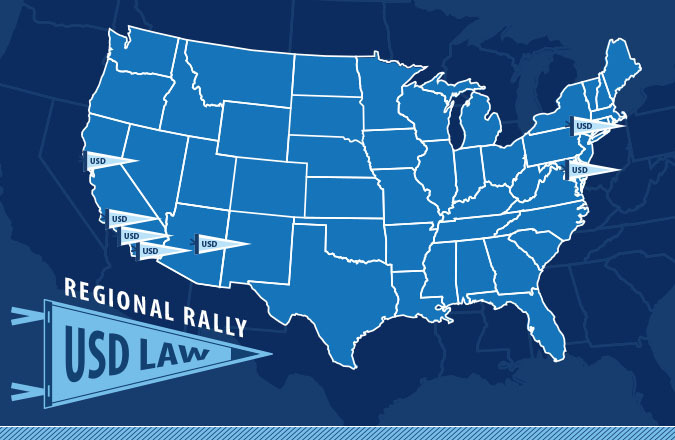 All gifts to USD School of Law from alumni at partcipating regions made between July 1, 2017 through June 30, 2018 are counted in this year's rally totals. In terms of participation, gifts of all amounts count equally. Alumni may support any law school designation or program, including student scholarships, the law Annual Fund, legal clinics or one of the law school's many centers and institutes. How can I get my region involved? Interested in leading your region to victory? Contact lawdev@sandiego.edu or (619) 260-4692.